Wherever you go or whatever you read you will always come across either an advert or article that is food related. With all the information in magazines and on the web (some information conflicting), many of us get so confused, that at the end of the day we end up throwing in the towel before we have even started. 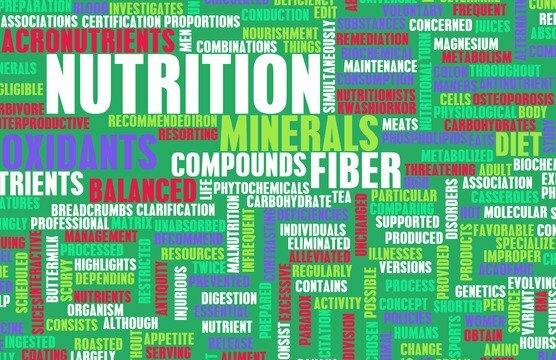 If you are a newbie to fitness and nutrition, the best is to ‘keep it simple’ – that’s it ….. no complication needs to be added to your hectic lifestyle. Here are a few pointers to get you started from Robyn – a qualified female personal trainer in Abu Dhabi. Make vegetables the foundation of your diet and vary your vegetable intake as much as possible for the full range of nutrients. Green vegetables have filling natural fibers. They are some of the lowest-calorie, and most nutrient rich foods on the planet. Protein is a great source of essential nutrients such as iron, it is also a source of a lot of fat. Choose low fat options and avoid high fat options such as sausages. Protein is essential for recovery and repair from resistance and bodyweight training. Think of breakfast as any other meal, you need a balance of proteins, fats, carbs and fibre. Breakfast is the most important meal of the day as it breaks the fast your body was in during sleep. This is also the ideal as it raises your metabolism as your body burns calories to digest your food and will lead to less over eating during the day. Eating small, regular meals every 2.5-3 hours a day will supply your body with consistent nutrients and energy and metabolism fired up all day. Simply put the more you drink the more it will slow your progress! Alcohol has almost twice the caloric content of an equivalent quantity of carbohydrate and protein. Reducing your caloric intake may simply revolve around changing from full or high fat options to low fat options or at least reduce your consumption of high fat dairy options. Drink plenty of water, specifically 6-8 glasses per day (equivalent to 2-3 liters). Water has no calories it also serves as a good appetite suppressant (provides a sense of fullness without adding calories). Have a large glass of water with every meal – it will be a great help for reducing caloric intake and make you feel full quicker. Another consistent recommendation is that you reduce you intake of products with unnecessary amounts of added sugar such as soft drinks, cakes and sweets. The average can of fizzy drink contains ten teaspoons of sugar. Instead go for natural sugars from fruit such as blueberries, strawberries, bananas and apples. High intakes of saturated fat (found in fast foods) are linked directly to premature death through cardiovascular disease. Choose healthier, lower fat options. Try lower fat cooking methods such as grilling as opposed to frying and roasting will help to reduce fat intake and switching to vegetable oils or coconut oil as opposed to the solid fats such as butter and lard will also be beneficial. A high intake of salt is directly linked to high blood pressure and premature death. Many fast foods and heavily processed foods are high in salt so generally westerners have excessive salt intakes. A lot of people think they eat healthy or the right amounts but are you. Make yourself accountable and track your food for a week – this will assist you with calorie counting and what patterns arise. Apps like My Fitness Pal are great for this. 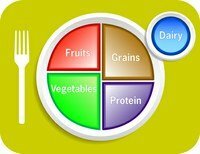 Using a visual representation, such as this plate to the left, can assist you to understand how the guidelines for the intake of certain foods and their recommended serving sizes translate into the makeup of their dinner plate.